The finished arbor frames a willow leaf pear. Archways and arbors are useful transitions in garden design, making a clear statement that one is entering a new area. They can mark the initial entrance into the garden from the street or driveway, or be used within the garden itself to indicate the beginning of a new journey – into a kitchen garden or woodland glade perhaps. Many homeowners will head to the nearest garden center to select something suitable, but options there are limited to what the buyer considered would be popular and sell easily. Finding or creating something unique may take a little longer but it needn’t be expensive or difficult. Perhaps the hardest part of the design process is letting go of preconceived ideas of what such a structure should look like. 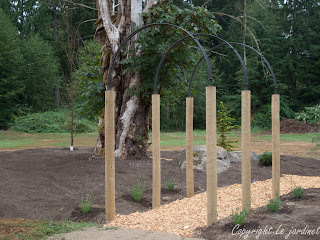 Certainly here in the Pacific Northwest, cedar archways and arbors are popular, and we have designed several for clients. They are sturdy, rot resistant and relatively easy to construct. Trellis panels can be added to the sides for depth and interest and the ‘roof’ can be horizontal, peaked or arched. However we faced an interesting challenge in our own garden recently. We needed to mark the entrance to a new island border which measures 100’ x 50’ and sits within our fairly open 5 acre property. 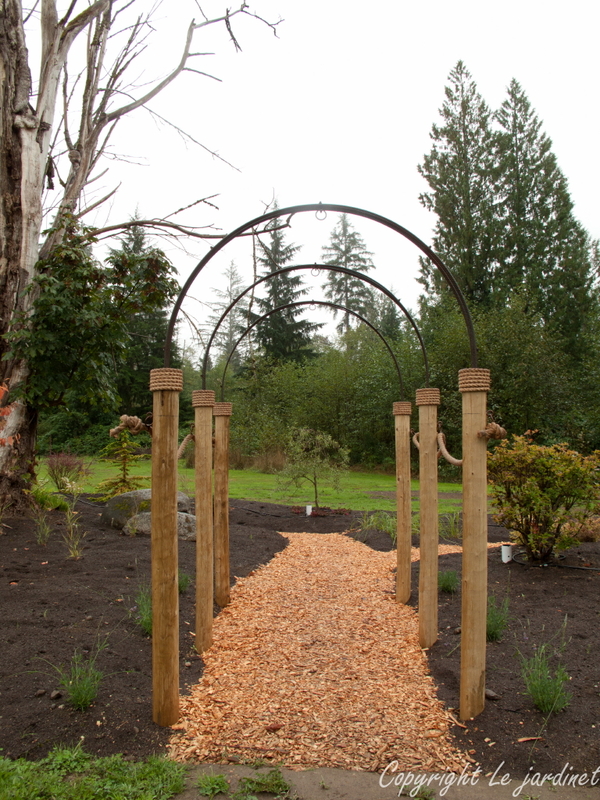 A simple wooden archway would look ‘lost’ and even a deeper arbor wouldn’t give us the appropriate scale. We didn’t want the feature to appear visually heavy or an enclosure yet it needed to be substantial. After endless sketches, brainstorming and online searches we came up with a design that we felt would work. 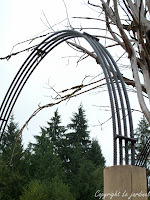 We would build three separate arches but link them together in such a way that the entrance still felt open and airy. We (this would be the Royal ‘we’!) set three, 6” diameter, ~7’ tall Redwood posts on each side of a 5’ wide path and spaced them 4’ apart. 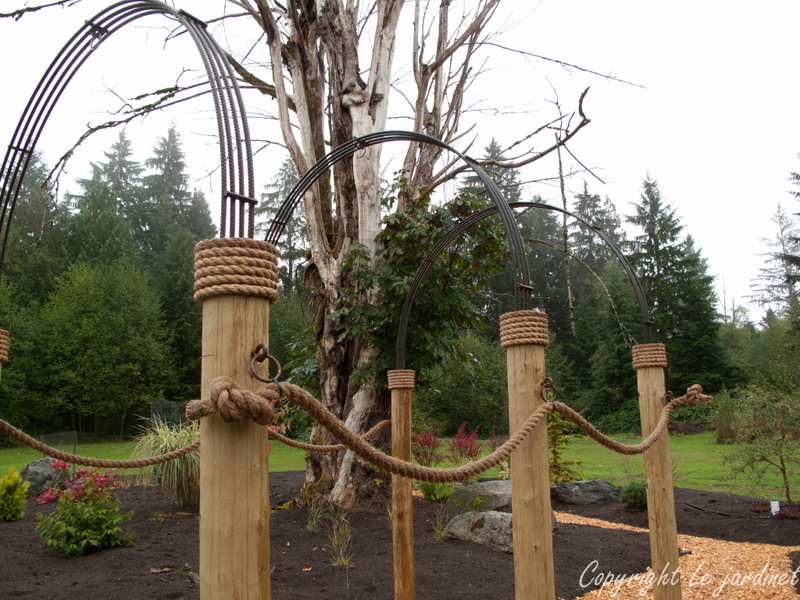 My husband Andy used a pipe bender to form four Rebar semicircles to span each pair of posts. 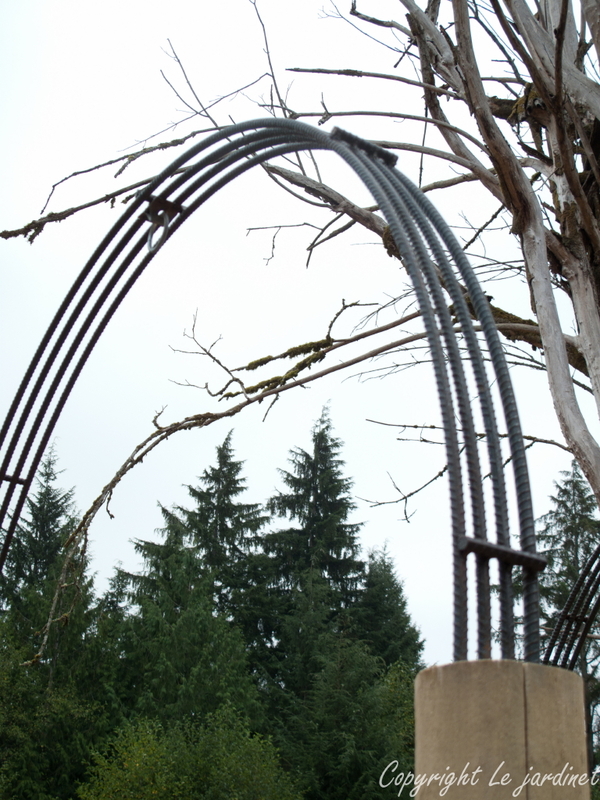 Between these he welded shorter pieces of Rebar both for structural integrity and architectural interest, as well welding a rusted metal hoop at the apex as a kind of inverted finial. Then we needed a way to connect the three arches so that it became a single unit for visual impact. We settled on 1.25” thick manila rope (also known as hemp) which we ordered from a marine supply store. We threaded this through metal hoops (purchased at a local feed store and rusted for a few days in vinegar) and allowed a gentle swag. Rope swags and collars were the final elements. The best designs are those which are modified as you go and it was at this point we decided to add a rope collar, this time using 0.75” manila, to the top of each pillar. We LOVE the end result. The variety of materials and textures makes it interesting while the rustic finish is in keeping with our rural property. Being one for detail, I also like the way the twists of the rope repeat those of the Rebar. It may have taken longer than a quick visit to the garden center and was certainly more work but we created something unique that is perfectly suited to the location. And although the materials came from several sources, none were expensive. Most landscape companies have a woodworker as part of their team and designers spend hours gleaning new ideas, so even if you’re not a DIY person you can still create something custom. Take a moment to consider your options before you go shopping. Job well done! Inviting. Graceful. Beautiful. Your arbor is fabulous. Simple lines that are so pleasing to the eye. And I love that you designed and built it yourself... that is our way too! SO much more rewarding. Thank you both! I think it's the mixture of materials that I especially enjoy. We've always worked with wood before - this was a way to allow ourselves to be more creative and experiment. My husband was thrilled as it meant he had an excuse to upgrade his welding equipment!! Fabulous! You're fortunate to have the help of your Partner to help you create and make it come to life! The New ‘Whizz-Bang’ Camellia from Monrovia!